About Makhni Paneer Biryani Recipe | Paneer Biryani Recipe: Fried paneer cubes doused in a creamy gravy, layered with rice and cooked 'dum' style. 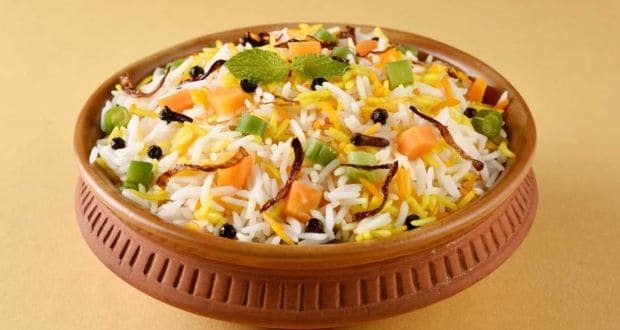 A perfect biryani recipe fro vegetarians and a paneer lover's delight! 1.Sear the paneer cubes in ghee. Then season it to taste and set aside. 2.In the same pan, add the whole spices such as cinnamon, cloves, black cardamon, green cardamon, black peppercorns, mace. 3.As the spices crackle, add the chopped onions, green chillies, ginger garlic and fry for 2 minutes. 4.Add the powdered masalas followed by the tomato puree. Simmer for 10 minutes or so. 5.Then add the cashew paste and cream. Season to taste. 6.Add the paneer into the gravy and bring to a gentle simmer for 6 to 8 minutes. 7.Using a greased baking dish or handi, layer the paneer and rice alternatively. Garnish with fried onions, nuts, fresh mint and coriander. Cover with aluminium foil or heat gently for 25 minutes. Serve hot. Its a perk for the veggans ! They are gonne love it.